Consumers are no longer looking at billboards in the same way they did 20 or 30 years ago. While billboards may still be considered premium advertising space, consumers are engrossed in their smartphones, tablets, and gaming systems. Eyes are down, not up, for much of our lives. However, that doesn't mean billboard advertising is to be discounted or ignored. 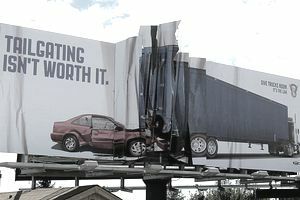 Billboards are everywhere, and even though we remember just a handful, they can still have a powerful branding impact. With outdoor advertising upping the stakes and becoming increasingly more competitive, plus digital advertising becoming the medium of choice, it’s important to know how to make your advertising count. Considering we’re on the move when we read billboards, we don’t have a lot of time to take them in. Six seconds has been touted as the industry average for reading a billboard. So, around six words should get the message across. You can push this to a few more words depending on their length and ease of reading, but as a rule of thumb, less is more here. Concision is tough, but headlines that are small paragraphs will not get read. And that means if you have a complex brand, product or service, you probably should stay away from billboards. Most of the time, billboards are aimed at drivers, bikers, cyclists, or pedestrians (which is why you have just a few seconds to get a message across). This causes an interesting dilemma for the advertiser. You want to get noticed, but you don’t want to be responsible for major, or even minor, accidents. So, while being distracting is paramount in many media, it’s a fine balance with the billboard. There are some truly awful billboards covered in phone numbers and website addresses. And without a doubt, 99.9 percent of the people who actually read the billboard will not call or visit the website. A billboard is a secondary advertising medium, which means that it’s ideal for brand-building and supporting a campaign, but it just cannot do the heavy lifting. If you want a more intimate conversation with your target audience, use print advertising, television, radio, flyers, websites and direct mail. Billboards are the wrong medium for anything other than a quick message. However, if your website or phone number is the headline, and makes sense, then you have an exception to the rule. A boring billboard will be ignored. A smart billboard will grab the attention and leave a lasting impression. A billboard that’s trying to be too clever, well, it will get lost on the audience. As a rule, you don’t want billboards to make people scratch their heads and wonder what is going on. Complex visual metaphors are no good here. They say advertising should be like a puzzle to solve and should give the audience a sense of fulfillment to know they figured it out. But billboards should be much simpler than that. You’re in the business of advertising, not showing off how clever you are. One billboard is not cheap. But it’s also not very effective either. Billboards are a mass market medium, but they need support. Every billboard has a rating, called Gross Ratings Points (GRP), based on traffic, visibility, location, size and so on. This rating gives you a showing score between 1 and 100. If it’s 50, it means that at least 50 percent of the population in the area would see one of your boards at least once a day. If you have only one board, your impact chances are obviously less than if you have four or five. You want to get close to a 100 showing, but that’s not going to be cheap (and may end up being more annoying than impactful). Get creative with your billboard ideas. A flat billboard is standard, but it doesn’t have to be the norm. You can go 3D, have moving parts, have people interacting with it and even have your billboard animate. There is no reason that it just has to be a large, simple print ad. This is your opportunity to do something eye-catching and memorable, so go for it. The upside to this is it can create additional press, for free. One of the most parroted pieces of client feedback ever given in advertising is "make the logo bigger." The reason for that is easy to understand. The client is paying a lot of money to advertise his or her brand and wants the consumers to walk away with that brand planted firmly in their heads. However, there is a balancing act that has to be played. Too big, it's horsey and distracts from the message. Too small, it's a clever ad for a brand no one connects with. So, you have followed all of the rules above. You've designed yourself one fantastic billboard. It's clean, it's concise, it's got contrasting colors, it's interesting, and it will work. But will it be seen? Will it be read, and understood? Here's a quick test to ensure you are not wasting everyone's time and money. Print out your billboard to the size of a business card. Now, hold it out at arm's length. Are you still getting everything you were when it was displayed on your 27-inch monitor? If not, go in and refine it. This needs to pop. And remember, you have roughly 10 seconds to get your message across.